Last week, the jBPM team announced the 6.2.0.Final release (announcement here). In this release (like in previous ones) you can author processes, rules, data models, forms and all the assets of a BPM project. You can also create or clone existing projects from remote GIT repositories and group such repositories into different organizational units. Everything can be done from the jBPM authoring console (aka KIE Workbench), a unified UI built using the Uberfire framework & GWT. In this video you can see the dashboard in action (do not forget to select HD). Organizational units can be managed from the menu Authoring>Administration>Organizational Units. Every time an organizational unit is added or removed the dashboard is updated. Likewise, from the Authoring>Administration>Repositories view we can create, clone or delete repositories. The dashboard will always feed from the list of repositories available. As shown, activity monitoring in jBPM can be applied to not only to the processes business domain but also to the authoring lifecycle in order the get a detailed view of the ongoing development activities. 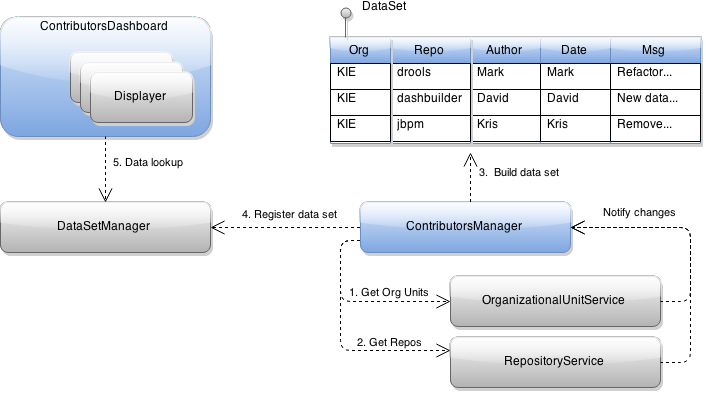 The following diagram shows the overall design of the dashboard architecture. Components in grey are platform components, blue ones are specific to the contributors dashboard. The ContributorsManager asks the platform services for the set of available org. units & repos. Once it has such information, it builds a data set containing the commit activity. The contributors dataset is registered into the Dashbuilder's DataSetManager. All the steps above are executed on application start up time. Once running, the ContributorsManager also receives notifications form the platform services about any changes on the org. units & repositories registered, so that the contributors data set is synced up accordingly. 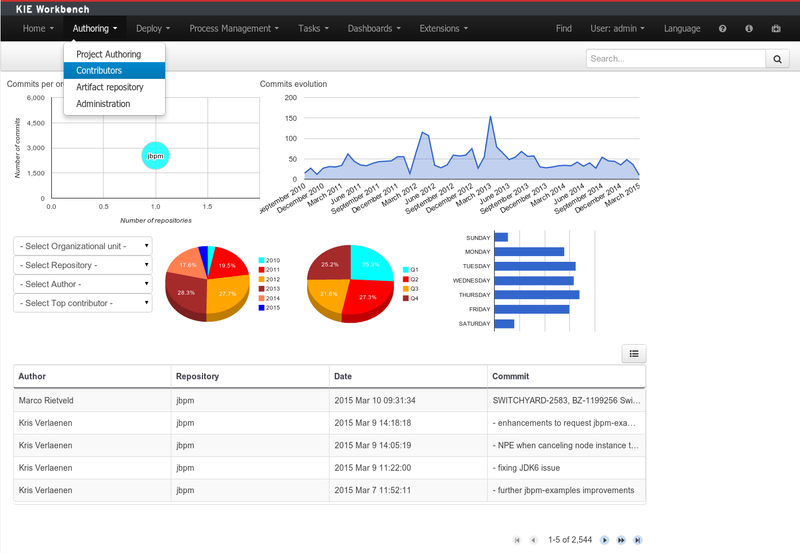 From the UI perspective, the jBPM's contributors dashboard is an example of hard-coded dashboard built using the Dashbuilder Displayer API which was introduced in this blog entry. The ContributorsDashboard component is just a GWT composite widget containing several Displayer instances feeding from the contributors data set. This has been a good example of how to leverage the Dashbuilder technology to build activity monitoring dashboards. In the future, we plan for applying the technology in other areas within jBPM, like, for instance, an improved version of the jBPM process dashboard. We will keep you posted!